Stop being humanly religious and instead be religiously human. Religion, at best, is the path, not the destination. If religion could have helped us find God, all of us, you, me, everyone, should have met God and got Her autograph. Why is it that only few have seen God, fewer have experienced God, only a miniscule have KNOWN God and maybe, just a handful, know that THEY ARE God? That’s because, a large mass of humanity is religious, while a minority is spiritual. To be sure all religions, and there are over 300 of them globally, champion God-realization. And promise the path to God. Not that they are wrong. 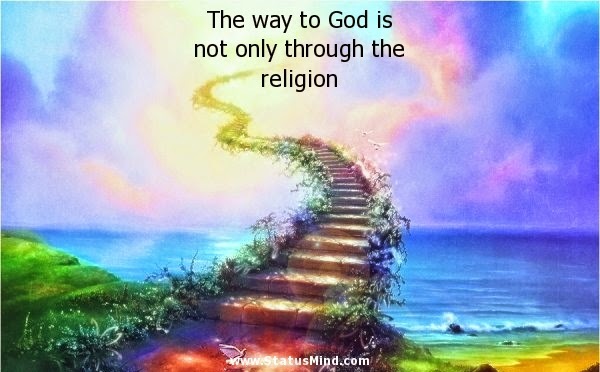 But we, the followers, have become so obsessed with the path, not even the journey mind you, that we have come to imagine that being religious IS knowing God. To be religious is to be dogmatic, persistently ritualistic, about a faith. The only faith worth being religious about is being human. Most of humanity, however, while obsessing over religion, has completely forgotten what it means to be human. Take the case of Republican Jon Huntsman, who once was in the race for the Amercian Presidential nomination. A principal__political, not principled__charge against him was that he was raising two adopted daughters from other religions: one a Chinese Buddhist and the other an Indian Hindu. Does it really matter? The color of our skin and the nature of a faith that has been__like our birth__thrust upon us, without our asking for it, without choice to us, is not who we are. We are all human. Period. And we are not divided by race, nationality, faith and such as we imagine it to be. We are all one. Period. All of us have the same 5.5 liters of blood. And it is all red in color. All of us breathe the same Life source. What I exhale you breathe. And what you exhale I breathe. When I can breathe in what you breathe out, and live, why can’t I raise a child that happens to have embraced the same faith as you? If I can, why can’t Jon Huntsman? Huntsman and his wife have seven children, including Gracie Mei, 15, who was abandoned at a Chinese vegetable market at two months of age, and Asha Bharati, now 9, who was left to die on an Indian village dirt road the day she was born. A hands-on dad, Huntsman speaks to Mei in Chinese and is encouraging little Asha to learn about and appreciate her Indian culture and Hinduism. Had Huntsman got his party’s nomination and gone on to win the race to the White House, America would sure have shown the world what it means to be human__not just a Democrat or Republican. So true. Let me hasten to clarify that I am neither for atheism nor against religion. I am pleading for us all to just be human. And it begins with each one of us. We don’t have to adopt abandoned children, if we don’t want to, to do this. We don’t have to stop practicing our individual faiths to do this. We just have to stop clinging on to anything that divides us__race, nationality, color or religion. Instead, let’s celebrate being human. And let’s do that without fail, every moment of our lives, from here on__religiously! Believe me, that’s when you will find, just as I have, God!